From the novel by David Karsner. Cinematography by James Van Trees. Film Editing by Herbert Levy. Costume Design by Earl Luick. Makeup by John Wallace and Perc Westmore. Production Management by Robert Ross. Assistant Direction by Frank Shaw. Set Direction by C. Chapman. Sound Direction by Francis J. Scheid. 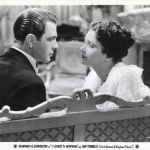 I Loved a Woman (1933) ranks down among the least memorable of Kay Francis’ films. It’s a decent movie, but it’s more of a star vehicle for Edward G. Robinson. Kay is just has some nice scenes as Robinson’s leading lady. The film was based on David Karsner’s book about a determined businessman, loosely based on the life of Samuel Insull. 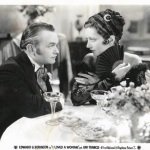 However, many point out the similarities to the life of William Randolph Hearst, largely because I Loved a Woman has many similarities to the cinematic masterpiece, Citizen Kane (1941). Edward G. Robinson plays a character much like Orson Welles’ Charles Foster Kane, and Kay Francis as Laura MacDonald, a beautiful but not too talented opera singer, seems to predate the Susan Alexander mold. However, these characters are more neutral, and Kay isn’t a shrieking alcoholic bimbo with no respect for her lover or herself. Robinson didn’t like the script, and made his objections loud and clear. 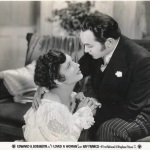 But he did insist on having Kay as his leading lady, much to her disapproval. 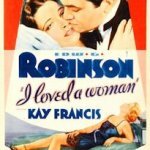 She wanted nothing to do with I Loved a Woman, and was not surprised when the 5’5” Robinson tried to cut the 5’7” Kay down to his size take after take. 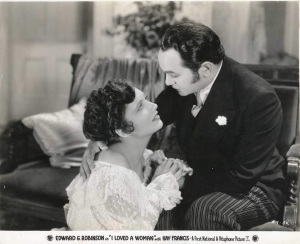 In many of their scenes together, Robinson was forced to stand on a box and have Kay lean into him. 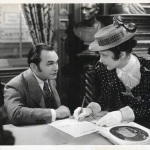 Years later, Kay still maintained that her best scenes had been cut from the final print. The film was a complete dud. Though John Hayden is an art lover first, his father had spent his life building the most prominent meat packing company in the entire United States. So when his father dies, John is forced to take over where his father left off, even marrying Martha Lane, whose father, Charles Lane, has built the second greatest meat packing company in the US. Unfortunately, John knows little about business, and the company slips from first to sixth within the matter of only a few years under John’s watch. He is forced to borrow money from his father-in-law, while his marriage suffers considerably at the same time. In his office one day, a young woman named Laura MacDonald arrives. She was sent from the Metropolitan Opera House, where she had studied, and asks John is he will sponsor her. An ambitious young woman, she has mapped out every single detail, and has John in awe of her before she even sings her first song. Going back to her place, his emotions overcome him as she sings “Home on the Range,” a tune that his father used to play to him when he was a child. They come to a mutual agreement to remain friends before lovers, and Laura takes off to Paris to study more before she makes her debut. But before she goes, she tells John to think less of her, and more on turning the luck of his business around. He’s got the resources to really make a success of himself, she tells him, and he takes her advice seriously. When the Spanish-American War begins, John gets a $50,000,000 dollar deal with the services to supply the meat for the soldiers. Unfortunately, his cheaply produced product causes “more soldiers to die from poisoned meat than Spanish bullets.” He can care less about the situation, having made his money and enough to pay his father back every cent he borrowed from him. Confronted by Theodore Roosevelt at a party, John arrogantly dismisses the future president’s threats to tear down his corrupt business, and is even more cocky when McKinley wins the election, not seeing Roosevelt as a threat even in the Vice Presidency. McKinley is assassinated, and one of Roosevelt’s first actions is to tear down the corruption of the meat industry. John is tried for manslaughter because of his ill-manufactured goods, but acquitted. Later, he discovers that Laura has been unfaithful to him all along. In reality, she has used him merely to get to the top. While she had respect for him as a friend, she never really loved him, and it’s John anger over this dilemma which causes his ruthless drive to soar higher than he ever has before. Archduke Ferdinand is assassinated. World War I begins. John signs numerous deals with countries to supply meat products to their soldiers, going crazy on over sizing his business to meat the demands. The war ends, however, and John is left with an overstock of product, and crumbles faster than he had ever built himself up. Every bank turns him down for loans. Ruined, he goes back to Martha to see if she will go to her father for money. Martha, who has known all about John’s corruption and affair with Laura, is glad to see him finally collapse from his own selfishness. She decides to finally leave him, and the next morning John is indicted, but slips away to Athens to escape. It is there, ten years later, when Laura MacDonald returns to see him. At first he cannot remember her, but it all comes back when he hears her sing “Home on the Range.” As she gets nearer to John, who has aged considerably, he is unable to recognize the once dark brunette beauty who stole his heart. He claims he doesn’t know her before he announces how tired he is, before leaning back and probably dying. While a little long, this movie does have production values. The sets are beautiful, and there is a realistic feel of the 1890s, completed with Kay and Genevieve Tobin looking radiant in the period wardrobe. Both women really steal the spotlight in every scene they’re in. Though she becomes spitefully vindictive by the end, there is a lot of sympathy for Tobin’s wronged wife throughout the movie. And she sticks by her husband, pretending that she has no idea what it going on when she knows perfectly well what a snake he really is. Watch her from the beginning to end. As she first learns of John’s shady deals, she carries on in a solemn manner; very quiet and long-faced. But by the end, especially that final scene in the bedroom, she has a nasty little smirk on her face because she knows he is about to get exactly what’s coming to him. Now Kay does good with her character’s ruthless ambition to become a celebrated opera star, even if her singing is horribly dubbed with a voice that comes nowhere near to her own. Her hair here is also beautiful, which is worthy of mention only because Warner Bros. seemed to be having a hard time finding a right style for her in these years. Though she is beautiful throughout the movie, she seems a little too modern–too art deco–to be placed in Gay ‘90s surroundings. In her first scene, the one where she meets John in his office to discuss his sponsoring her, her dialogue is filled with R after R, and it gets a little difficult to follow her as she mispronounces word after word. Slightly embarrassing for her, it’s cute to watch for the audience. Edward G. Robinson is all over the place. His performance is about as smooth and consistent as the Rocky Mountains. He bursts out with theatrical reactions in one scene, but is completely mannered down and appropriate in another. It’s a difficult part for any actor to play, and considering how talented he was, a fault can be put either on the director or screenwriters. I’d blame the screenwriters. Filled with bizarre circumstances, and a classic cowboy song being played over and over again in the country’s second most hectic city, I Loved a Woman is far from being the best movie ever made. It’s one that doesn’t need to be seen more than once or twice, but it’s worth a look because of its cast of characters, and because of its strong influence over Orson Welles’ Citizen Kane. 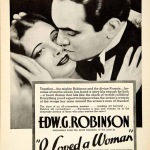 Edward G. Robinson’s latest picture, “I Loved a Woman,” which owes its origin to a book by David Karsner, is a worthy offering, even though it is open to the accusation of being anti-climactic. It is concerned with the crimes of Chicago meat-packers both during the Spanish-American and the World Wars and in it Mr. Robinson has an excellent opportunity for a definite characterization, of which, it need hardly be said, this efficient actor takes full advantage. 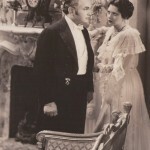 It has the further distinction of having been expertly directed by Alfred E. Green, who reveals his perspicacity in his selection of the supporting cast. 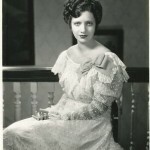 These players include Kay Francis, who portrays a somewhat heartless opera singer named Laura McDonald, and Genevieve Tobin, who appears as Martha Lane, the girl who becomes the wife of John Hayden (Mr. Robinson). The story opens in Athens, Greece, where Hayden is picking up art treasures, and it closes with Hayden in the same capital, to which he flees to escape the American authorities. It is a case of an individual with artistic inclinations having a business career thrust upon him. It is, perhaps, in revenge for this that he becomes a conscienceless man of affairs, one who does not hesitate to sell “embalmed beef” to the United States Government for the troops in Cuba during the Spanish-American War and later does virtually the same thing during the World War. When he first takes his late father’s place as the head of a packing concern which the Haydens have run for three generations, he is a gentle soul, whose sympathetic nature is revealed when he surprises his colleagues by trying to raise money to improve living conditions of the stockyard toilers. Martha inspires him to do this good work, but after she is married to him she seems to be mainly interested in society life. 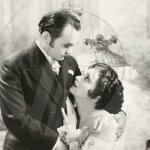 Hayden’s ambition to rise to the top and his change in business methods is due chiefly to Laura, who comes to him with a letter of introduction from a New York impressario and asks him to finance her operatic studies in Europe for two years. She is confident she will be able to repay the loan, being, as she says, as sure of success as she is of death. The packer goes to her apartment to hear her sing and after she has sung several operatic arias. 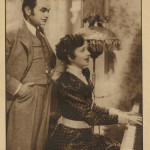 Hayden, somewhat demurely, asks her if she knows “Home, Home on the Range.” Miss Francis delivers this song with fine effect and the refrain is heard at various stages of the film. After a few flashes of fighting in the Spanish-American War, Theodore Roosevelt, impersonated by E. J. Ratcliffe, appears and he does not hesitate to denounce Hayden for sending bad beef to the soldiers. Hayden, through contributing to campaign funds, claims credit for having shelved Roosevelt as Vice President, but after the news of McKinley’s assassination, the packers tremble and in course of time Hayden is indicted and tried, but he is acquitted. One would imagine that this experience was enough, but he becomes more and more grasping in his business deals and, when the World War Armistice is signed, he finds he had overestimated the duration of the war in the matter of contracts and is in a sorry dilemma. The story hangs together exceedingly well until Hayden’s acquittal for his dealings with the government during the Spanish-American War, but thereafter the incidents are somewhat incredible. 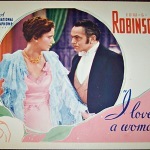 Mr. Robinson’s portrayal rivals his splendid impersonation in “Silver Dollar.” Miss Francis is excellent as the opera singer and Miss Tobin gives one of her best performance as Martha. Published September 22, 1933 in the New York Times.